Following are examples of the informational items we are looking for and the way we would like them presented for our book. Chapter 4 - Inscribed/Engraved: A picture of the inscription or engraving. 3036 - Inscribed Smith & Wesson Model No. 2 Type IV Army Revolver. Serial No. 39807 is a .32 caliber, 6 inch barrel with a silver-plated finish. Right side of frame is inscribed G. G. Tanner. Rosewood grips. Condition: Excellent. Serial No. 67853 is a .32 caliber, 6 inch barrel with extensive scroll-engraved coverage. It has a nickel-plated finish with a gilt hammer. Elephant ivory grips feature a relief-carved Mexican eagle and snake on the right side. Together with a rosewood case, the lid with vacant brass escutcheon. Reversed French-style interior is lined in purple velour and contains cleaning rod and cartridge block. Condition: Very good. Chapter 5 - Unusual Markings, for example: Kittredge, Oriental R. White. Example 1: First recorded Type 8. 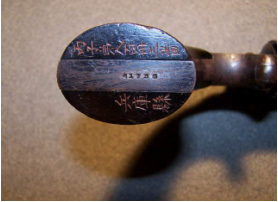 Insert shows oriental markings on bottom of grip. Note: The Model #2 (above) had a new frame but the hammer and trigger are plain rather than knurled. (Perhaps S&W were using up parts they had in inventory. Historic Smith & Wesson Model No. 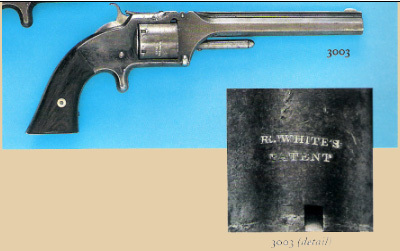 2 Type 1 Army Revolver. Used as Evidence in the Rollin White Patent Infringement Trial. Serial No. 149, .32 caliber, 6 inch barrel, blued finish retaining 35-45%. Cylinder with standard patent markings and additional stamping R. White's/Patent. Rosewood grips. Condition: Very good. A change or modification: for example, rim fire/centerfire. Cut for a stock conversion to .22 Caliber. After Market means anything that is not factory-standard. Serial No. 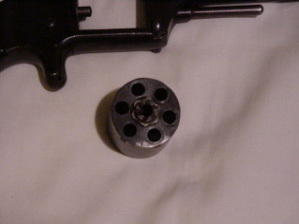 65238, a .32 caliber, 5 inch barrel with the left side showing Japanese police markings. It has a blued finish and Rosewood grips. The frame shows period alteration to accept bag-type grips found on Model 1 1/2. Condition: Very good as configured. Retains 15-25% blue finish overall. Grips have scattered blemishes. HERE COMES THE JUDGE...and he's packing a pair of revolvers! Owned and inscribed by a Denver, Colorado police judge 1869-1879, who was later U.S. Commissioner for the Colorado Land and Mineral Association (1880-1882). This is a matched pair of Smith & Wesson Model 2 "Army" .32 caliber rim-fire revolvers with 6 inch barrels. Each gun has matched engraving on left side plates, "JUDGE ORSON BROOKS / DENVER COLO." Visible on one gun is the stamped markings of the famous Cincinnati arms dealers, "B.KITTREDGE & CO" on the side of barrel. (Markings are clear, but light.) Frame markings with name are excellent, showing wear consistent with the guns' age. 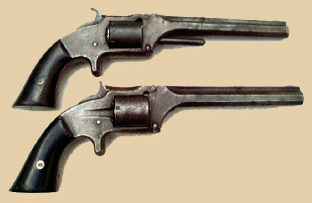 The revolvers show much wear and use; age browned; each has an old repair at the hinge where barrel is fitted. One gun has a repair on the underside of frame where barrel latch fits. Both are age-browned and untouched, in an uncleaned condition with some patches of light pitting and blemishes overall. Barrel markings are excellent showing normal wear. One gun has small chip at extreme top of hammer spur and lacks the ejector rod, located under barrel. Both guns were altered during the period on one side of their recoil shields, where they were notched to allow for loading from the rear without need of removing the cylinder. They are in excellent condition mechanically. Original grips show wear consistent with guns' age but are very sound, slightly rounding only at butts. Rating: excellent. Denver was a wild and wooly town in the 1860s, the Gold Rush years of the Colorado Territory. (Denver was made capital of the Territory in1867. Colorado achieved statehood in 1876). The serial numbers indicate both were manufactured in 1865. The pair is accompanied by a wealth of documentary evidence about Judge Brooks (and perhaps much more will be uncovered). One very important account from a well-known history of Denver describes the first lynching in the town as being a direct result of the holdup and robbery of Judge Brooks himself. The perpetrators were identified and chased down, ending in a shootout in a saloon, killing one. The other was hastily tried, convicted and imprisoned. A vigilante committee soon formed however and dragged the malefactor out of jail and hung him. Serial No. 7410, .32 caliber, 6 inch barrel with blued finish, and Rosewood grips. The side is inlaid with oval silver plaque inscribed: Presented to/Lieut. Frank C. Wilson/By his Chicago Friends/ Sept. 25, 1862. Complete with brown velour-lined walnut case. Lot 011 - Lt. Col. Mullins, KY Mounted Infantry inscribed/engraved S&W Model Two, Old Army - with historical information. Serial Number 23432 is a .32 Rimfire with a 6" barrel. Condition is fine to excellent. Lovely period foliate scroll engraved, well executed w/ multiple crossovers. Period inscription on the backstrap reads "Lt. Col. M. Mullins / 40th Ky Mtd Inf." Barrel and frame retain about 90-95% period plating, with a bit of light pitting along the sides of the top strap. Cylinder is a soft gray. Working; has pitting & distinct rifling in bore; Assembly No. 5 matches on major components. Beautifully colored pearl grips have a shallow hardly-noticeable old flake from each panel, and a glued chip on the underside of the toe of one panel. Serial Number 23432 is scratched on the inside of the right panel; very close to the s/n of the gun; leading one to speculate that perhaps Lt. Col. Mullins had a pair of these. This Model #2 is accompanied by the Civil War military records of Union Lt. Col. Matthew Mullins of the 40th Kentucky Mounted Infantry, and Internet research documents. Born 8/26/1827 in Pendleton Co., Kentucky, where he also died on 4/2/1903, his Civil War service began in 1861 as Captain of the Police Guard of the Kentucky State Militia, after which he was instrumental in raising the 18th Reg. Ky Infantry, serving therein as a Colonel. He was later wounded in the leg in Richmond, Ky. Served as Lt. Col. In the 40th Ky Mtd Inf., and complimented by his commander for his conduct in routing CSA Gen. John Morgan's Raiders at Cynthiana on 6/12/1864. Included in his military record is a photocopy of a hand transcription of Telegraph to Gen'l Boyle from Brig. Genl S.S. Fry with the intriguing message - s/n "I received a Dispatch from Col. True last night stating that Lt. Col. Mullins had nothing to do with the outrages committed by the men of his regiment at Carlisle." The telegram appears to be dated Nov. 12, 1863. It's unknown whether it's relevant, but a skirmish at Carlisle PA occurred July 1, 1863. - The town had been overtaken by CSA forces a few days before, and was retaken by Union militia forces. - Gen. JEB Stuart's forces arrived and demanded surrender of the town, followed by shelling. Learning that the engagement at Gettysburg had begun, Stuart withdrew after torching Carlisle Barracks. One source speculates that Stuart's delay at Carlisle may have contributed to the Confederate loss at Gettysburg. - What "outrages" may have been perpetrated there by Union Forces remains unanswered at this time - s/n 23612, ca 1864 - antq -( estimate 3500 to 7500). Cased Smith & Wesson Model No. 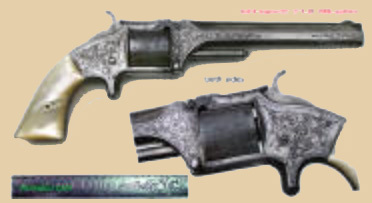 2 Type III Army Revolver Serial No. 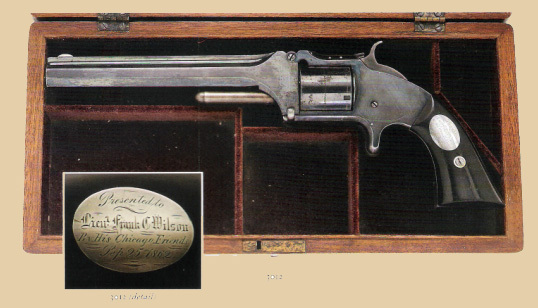 6297: a .32 caliber, 6-inch barrel with silver-plated finish and elephant ivory grips, complete with rose velour-lined partitioned walnut case.